Neighbouring some of the finest bars, restaurants and hotels in the city centre, behind Greek Street, Tattu Leeds opened in 2017. 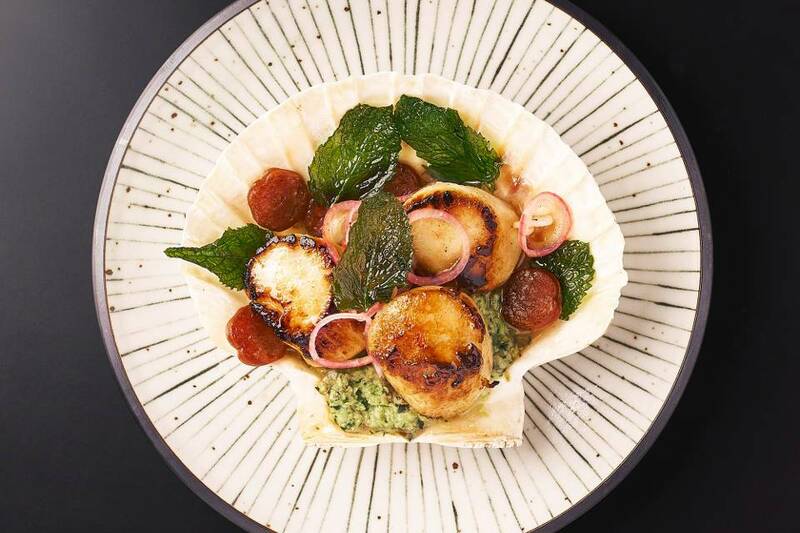 It has since become one of Leeds’ most popular upmarket restaurants that continues to stay away from your stereotypical Chinese menu. It’s a tough time for Chinese restaurants in the UK, but Tattu didn’t seem to project that at all. On a Tuesday night in a very quiet Leeds, with the exception of a few smaller tables in the quieter area, they were more or less full. We were welcomed by Will, ‘The Humble Bartender’, at the bar who immediately initiated conversation and made us feel very welcome. Being bourbon lovers, we asked about their new cocktails and he suggested we try ‘Emperors Spice’. Four Roses bourbon, think mellow spice, rich fruit, hints of sweet oak and caramel, combined with maple syrup, Antigua formula and ‘Roots’, a sweet liquor. The perfect pre-dinner cocktail. Escorted to our table, we sat down and spent over five minutes gazing at the decor, completely forgetting we had to order our food. 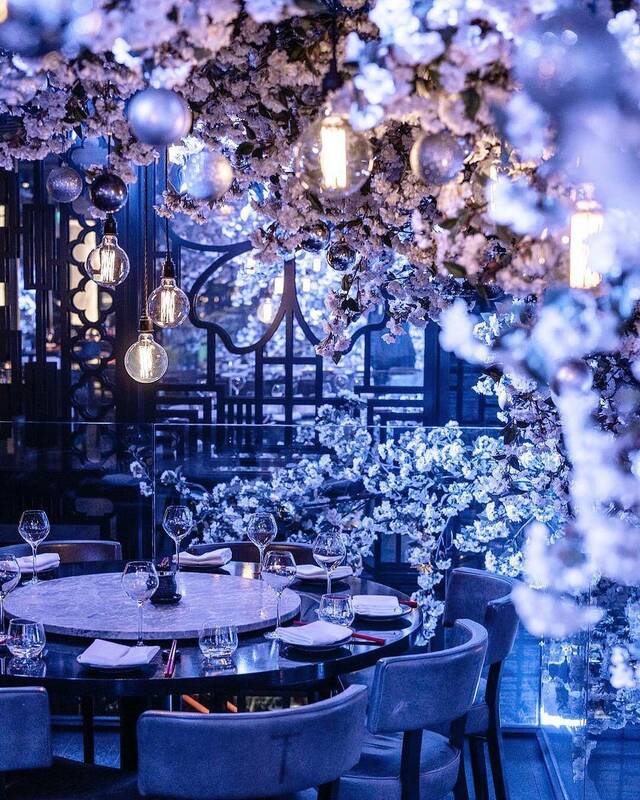 To anyone that hasn’t had the opportunity to see Tattu’s interior, it consists of the most beautiful blossom trees that are lit up by soft lilac lights. Heaven for any Instagram pro. In addition to the beautiful decor, the music is also very accommodating. Unlike some restaurants you might visit whose background music is so loud you can barely hear yourselves think, let alone maintain a healthy conversation. Our very friendly and helpful waiter Nicholas talked us through the new winter dishes and we made a few choices based on his recommendations. 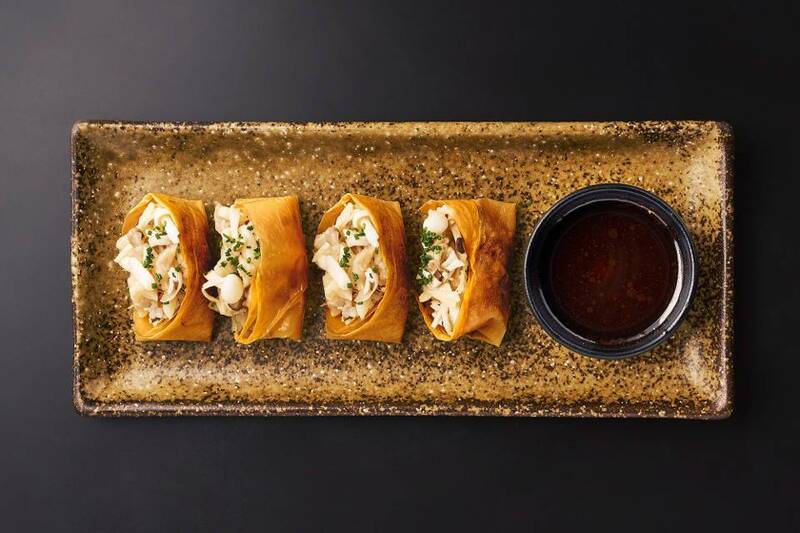 We started with the Spicy Iberico Pork Wonton served with Szechuan and peanut, the Wild Mushroom Spring Rolls served with truffle sour cream and Beef and the Foie Gras Gyoza served with Teriyaki and soy. 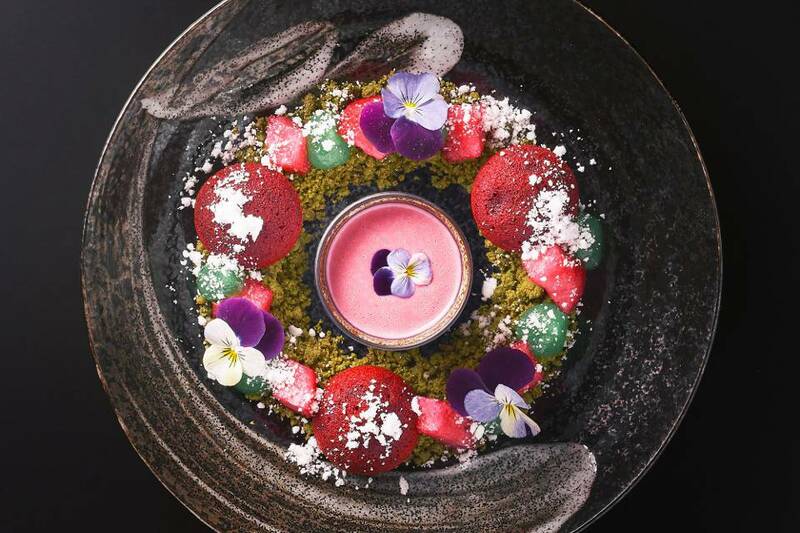 All of these dishes are found in the ‘Steamed’ and ‘Fried and Baked’ part of the A La Carte menu. All luscious, compelling and highly delicious. The Iberico was definitely my favourite on there, which surprised me as truffle is always my go to. If you’re not keen on spicy, then maybe opt out on the pork and go with the others. They are without fault, a perfect combination. We then venture onto the vegan dishes that’s recently been added to the menu. And whilst I’m always open to anything vegan, it seems to be very hit and miss for most mainstream restaurants. Fortunately, Tattu have gotten it right this time with their Tofu Pockets. 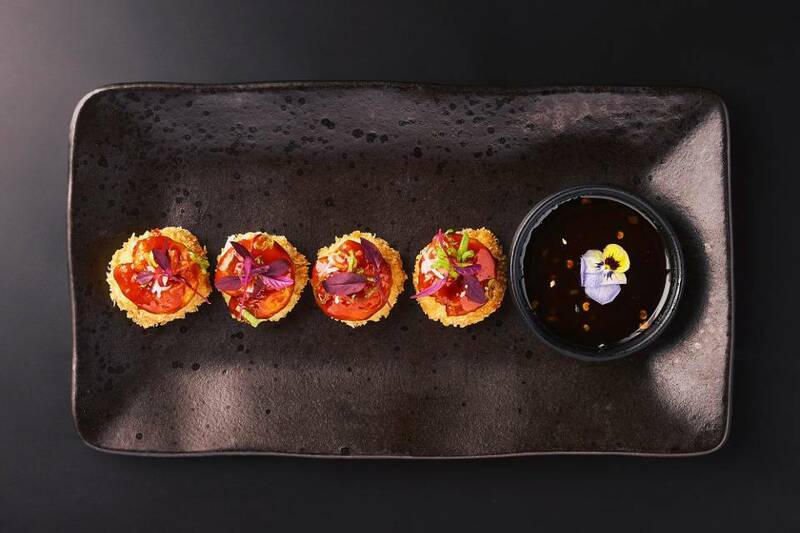 Sticky rice, wild mushroom and wasabi served with a ponzu mandarin soya sauce. A slightly larger portion, but full of flavour. Even the meat eaters enjoyed it. We then went for the fish options and tried the Sticky Red Prawns. Marinated in saki, ginger and sesame and sat on rice cakes, along with the Chilli and Sesame Roasted Scallops, Chinese sausage, crushed edamame and mint. Both cooked to perfection and full of flavour. By this time we are beginning to feel very full, so took a break and indulged in a glass of pinot noir and a breath of fresh air. 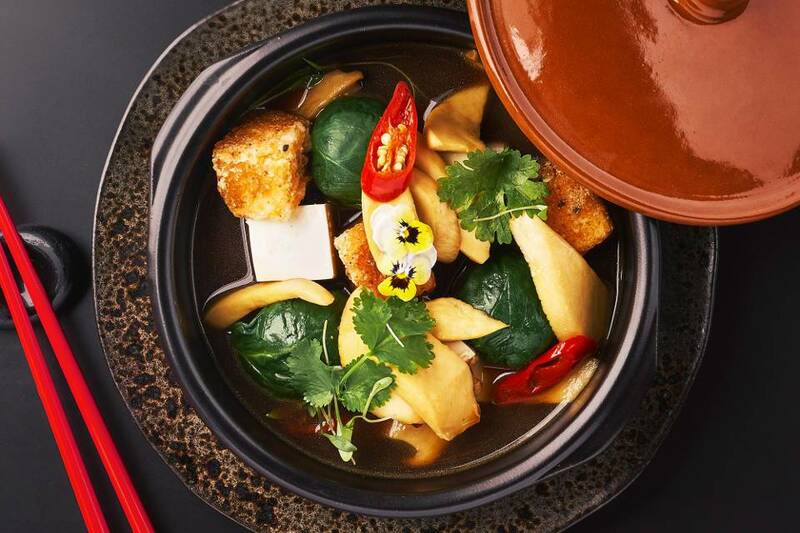 Back to the mains which consisted of the King Oyster Mushroom Hot Pot. I can’t quite get to grips with how much flavour this dish had. Baby spinach, silken tofu and yuzu truffle soy. It was so absurdly satisfying and I could have ordered it again if I hadn’t been so full. Do not miss this when you are there. Alongside the hotpot, we sampled the White Miso Salmon, cooked in pickled ginger, red onion and caramelised lime. Almost sweet, and accompanied with Duck Egg & Sausage Fried Rice and Pak Choi & Crispy Shallots. another winning dish of tastes and textures. Somehow after such a feast already, by some miracle, there was room for dessert. I opted for the Asian Pear Crumble, this stunning dish consisted of matcha and almond crumble, green apple semi-gel and pink custard. Usually, I avoid anything fruity, but even this was faultless. Like all of the other dishes we had tonight, there were so many flavours in this dish, it was hard to really pick out what I liked the most about it. The service was exceptional all night along with the food we’d had. It had left us feeling very satisfied, and I for one will be returning soon to have a second go at the mushroom hotpot along with some of their vegan options!